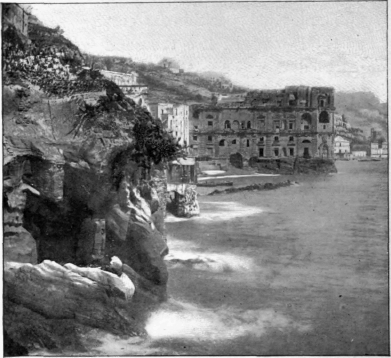 The Bay of Naples holds within its curving arms the history and the legends of two thousand years. Few spots on earth awaken such absorbing interest. Not one surpasses it in beauty. Even in this prosaic age it still remains a copious fountain of romance. Year after year, and century after century, the worshipers of Nature from all lands have come to render homage to its matchless shores, like the soft waves which steal in from the outer sea, kiss with a murmur of delight its crescent beach and then retire; but the fair bay remains the same, "a thing of beauty and a joy forever." 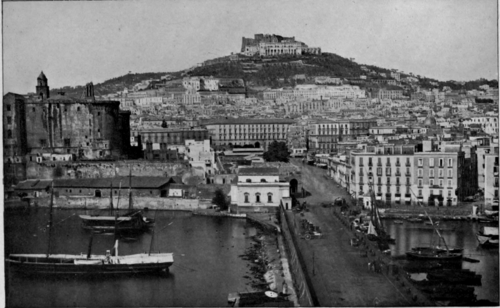 Yet it is not merely Nature that attracts us to the Bay of Naples. Its placid surface is a magic mirror which to the thoughtful eye reflects the pageantry of ancient days, when the world's commerce covered it with ships, and an imperial court adorned it with resplendent barges. Each graceful hill that rises from its waves, as well as every island that reposes, jewellike, upon its gently undulating breast, is crowned with some distinguished memory. Each breeze that dimples its transparent surface whispers, to him who hears aright, the name of some illustrious Roman who once made this shore his home. 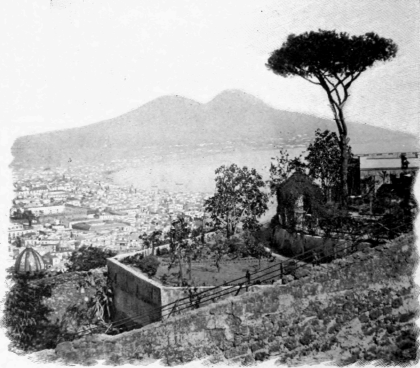 Moreover, towering far above it to an elevation of four thousand feet, rises that dark volcanic cone, Vesuvius, which even now holds up by day its smoking torch, and in the night seems threatening heaven with its shafts of fire; while to complete its mystery and charm, beside the changeless flood of this Vesuvian bay there lie two buried cities, slowly emerging from their lava shrouds after a sepulture of eighteen hundred years. These with a silent eloquence, incomparably more effective than all speech, are constantly reminding us not to forget amid the fleeting present the grandeur of a mighty past. Well was the city which arose here named by the ancients after Parthenope, a siren ! For this enchanting region has entranced the hearts of all men from the time of Homer to our own. It has the form of a gigantic amphitheatre, of which the arena is the sea. 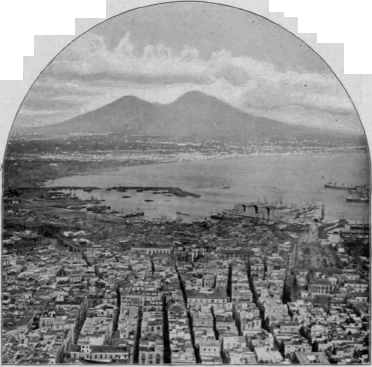 Vesuvius is in the centre, and on either side of it extends a crescent fifteen miles in length. This is, indeed, part of the hallowed ground of ancient Italy. Around it the mythology of Greece and Rome has cast a never-dying charm. The very air seems tremulous with classic memories. At every step we pass the site of some imperial palace or patrician villa. Vineyards and gardens still adorn these slopes, as when they furnished wine to Horace and to Hadrian; and on the hillside of Posilipo, beneath which "swells and falls The bay's deep breast at intervals," once stood the homes of Cicero and Virgil. Below the place where they resided the hill is perforated by a tunnel through which Roman emperors have passed. It was in use when Christ was born, and during nineteen hundred years its roof has echoed to the various languages of those who, in successive centuries, were masters of this shore. Quite recently, however, the roof of this gloomy vault, as if unable longer to support the burden of its memories, fell in with a tremendous crash, and it is now a ruin. 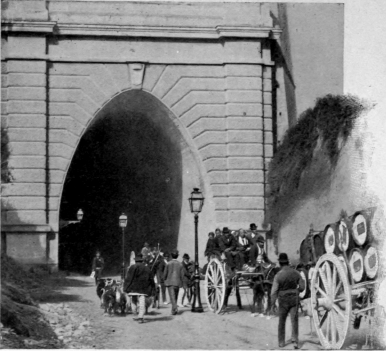 A new one, close at hand, has been opened to replace it, but I could not see in it much improvement over its predecessor; for, though a trifle wider, a part of it is the track of a steam tramway. 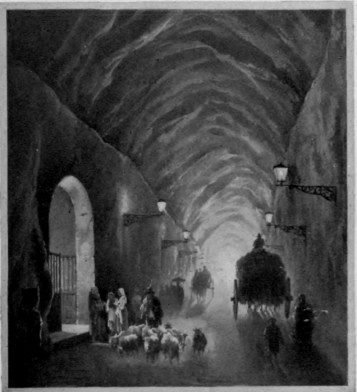 On more than one occasion the locomotive met our carriage here, startling the horse, and seeming like some old dragon of mythology rushing to seize its prey; since in this cavern, only forty feet in width, the iron monster's panting breath and heavy tread were by reverberation multiplied a hundredfold, till we could almost fancy that the mountain, with a savage roar, was crashing down to grind us into powder.